Ecuadorian artisans string achira seeds and glass beads on copper wire for these delightful danglers. Your plain white tee called: it wants its pop of color back. Handmade by artisans in Ecuador, these festive earrings will provide just that. 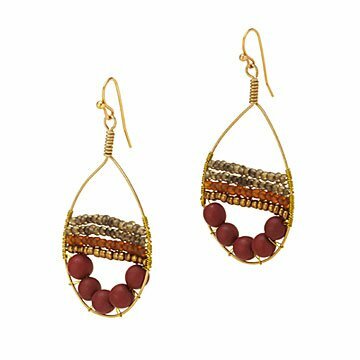 Crimson achira seeds and matte glass beads are strung on copper wire in a dewdrop shape, giving just enough delightful dangle to brighten up the day. Handmade in Ecuador.